The Democratic candidates running for governor. All six Democratic gubernatorial candidates support expansion of the state’s medical marijuana law. John Norris, a long-time aide to former Governor Tom Vilsack, said Republican Governor Reynolds should respond to critics who contend cannabis products intended for medical use will be exploited as recreational drugs. 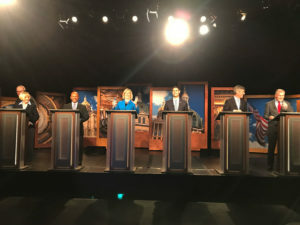 All six candidates were asked about the issue during a 90-minute “Iowa Press” forum sponsored by Iowa Public Television. Ross Wilburn of Ames, the former mayor of Iowa City, said it’s an “over-reaction” to suggest there is a “direct line” between medical cannabis and recreational marijuana. And Wilburn said his late father, who was diagnosed with Alzheimer’s, could have used medical marijuana as pain medication in the last two weeks of his life. Cathy Glasson, a nurse from Coralville, said medical cannabis has been very effective in treating lots of very serious ailments. Andy McGuire, a medical doctor, said it should be doctors, not politicians, who decide which conditions can be effectively treated with cannabis. Fred Hubbell, a Des Moines businessman, supports that approach, too, and called for making changes in the law. Hubbell mentioned letting cannabis oils, pills and creams with a higher concentration of the drug THC be sold in the state. Nate Boulton, a state senator from Des Moines, said the medical marijuana law must be expanded or the businesses that just won state licenses to sell cannabis products here won’t be profitable. Current state law has set up a system for allowing cannabis products to be used as treatment for a limited number of conditions. Five Iowa dispensing sites have been chosen for Iowa-produced cannabis oils, pills and creams, starting this December.